Baking another sourdough loaf before I put my starter back into hibernation. This is another one I can’t eat, so I will be gifting it to either Oceanside Animal Hospital or the staff at Bay Avenue Gallery in Ocean Park. 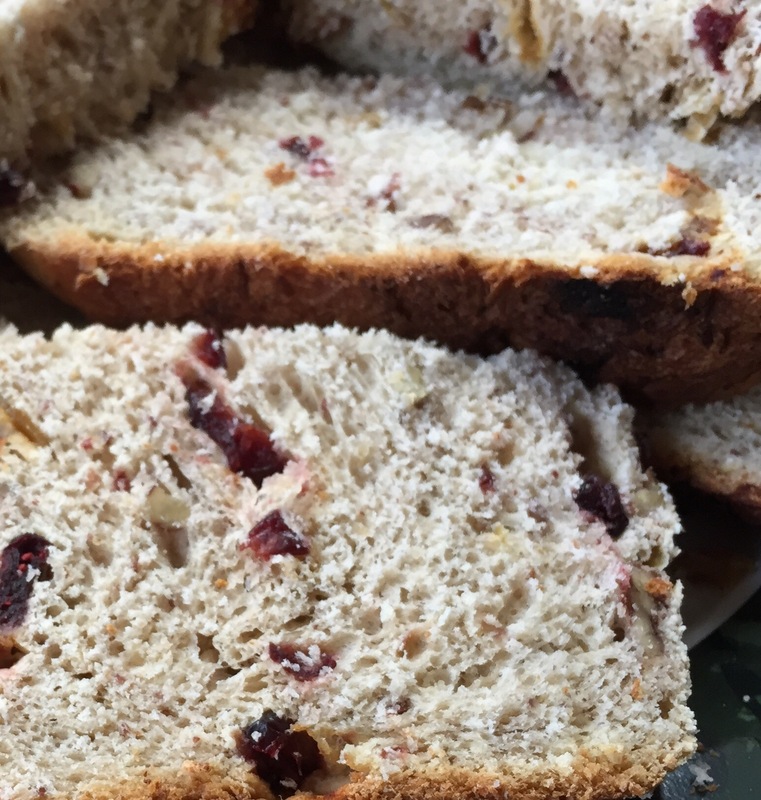 Last time I went to Trader Joe’s in Olympia, Washington, they had orange flavored dried cranberries, and I immediately thought of this recipe. I really can’t wait to find out how this tastes. I started putting 1/2 cup active sourdough starter into the bread machine pan. I then added 3/4 cup orange juice, 2 tablespoons butter, cut into pieces, 1 teaspoon salt, 3 1/4 cups bread flour, 3 tablespoons sugar, and 1 3/4 teaspoons SAF yeast. I set the Basic and medium cycles for my machine. After the machine beeped between kneads 1 and 2, I added 1/2 cup dried cranberries, 1/3 cup golden raisins and 1/3 cup chopped pecans. The dough looked a little dry, so I added a few more drops of orange juice. The author does note in this recipe that you can add the fruit and nuts at the beginning if you don’t wish to wait. As this is another sourdough, I have set myself an alarm to check the rise before baking begins.This one required another 90 minutes of rise time before I was comfortable enough to start baking it. The loaf baked up to a lovely golden brown, studded with fruit and nuts. It smells great too; the orange scent is quite strong. I stopped by today to pick up my plate and the comment sheet, but they couldn’t find the sheet. Not a problem, of course, the receptionist told me everyone loved it, especially the cranberry/raisin combo. I’m going to call this one a win. After all, 100% of the polled respondents (all 1 of them) told me how great it was. After all the loaves I baked over the past couple of weeks, I decided another sourdough was in order. I am imagining this bread served warm with melted garlic butter, or dipped in olive oil. I took my sourdough starter out of the fridge last night to wake it up. I made my sponge and let it rest, covered, at room temperature until this evening when it was bubbly and active. This recipe calls for “3/4 cup chopped canned tomatoes with ‘some’ liquid.” I really hate when something is vague like that. I know the ratio of liquid to dry ingredients in bread is so important, so I will try to keep an eye on the dough, adding more liquid or flour if necessary. Into the bread machine pan, I placed 3/4 cup sourdough starter, the (partially) drained tomatoes, 2 tablespoons olive oil, 1/2 teaspoon salt, 3 cups bread flour, 2/3 cup crumbled feta and 1 1/4 teaspoon SAF yeast. This bread uses the basic cycle and dark crust settings on my bread machine. 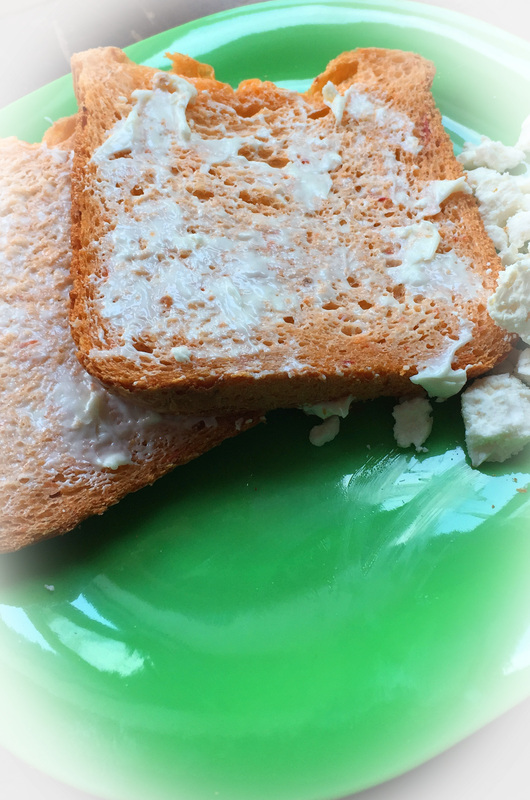 The author mentions that you can substitute crumbled fresh goat cheese for the feta, if you prefer. Feta is too strong for some people so that can be a deciding factor. As far as health benefits, feta has slightly less saturated fat than soft goat cheese but twice the sodium. Well, it looked fine while it was mixing, kneading and rising, so I didn’t add anything else to the dough. It rose beautifully and now I am just waiting for it to finish baking and hoping it won’t crater on me again. It smells lovely, I have always been a fan of tomatoes and feta, can’t wait to try this bread. This is such a pretty loaf of bread. It is a lovely pale orange color and has small bits of tomato throughout. The smell is significantly more tomato than feta, but both flavors come through very well. Tender and slightly chewy with a crispy crust, this bread reminds me a bit of tomato soup in aroma and flavor. As such, I am guessing it would make an excellent toasted cheese sandwich. The only downside is that there isn’t much “sour” flavor from the sourdough. That is just a matter of personal taste, though. I suppose if I used an older starter, that had more time to ferment, I would have found a more powerful sour flavor. I wanted to bake this loaf for my dad, and since he will be home soon, I got it ready and put it in the freezer for him. I am not a fan of really spicy foods. I own my wimphood. When I go out to a Thai restaurant and they ask, “How spicy, 1 to 4?” I always answer, “zero.” I think Dad will appreciate this one, though. Before beginning this loaf, I drained and dried (using a paper towel), a 4 ounce can of diced jalapeños, removing as many seeds as possible. I also shredded 4 ounces of longhorn cheddar cheese. Once the jalapeños were dried, I added my ingredients to the bread machine. In order, I placed 1 cup water, the jalapeños, the cheese, 1 teaspoon salt, 3 cups bread flour, 3 tablespoons dried buttermilk, 1 tablespoon sugar and 2 1/2 teaspoons bread machine yeast into the pan. I set the crust for medium and the bread cycle for basic. This smelled great while it was baking. I may not be able to eat spicy, but I can appreciate the smell. Longhorn cheese is known to meld well with Tex-Mex flavors and the if the smell is any indicator, this is going to be a tasty loaf of bread. I will have to let you know more after he gives me his taste test results. Before I started baking, I cooked 4 ounces of pancetta in a skillet until crisp. After that finished cooking, I placed it on paper toweling to cool. 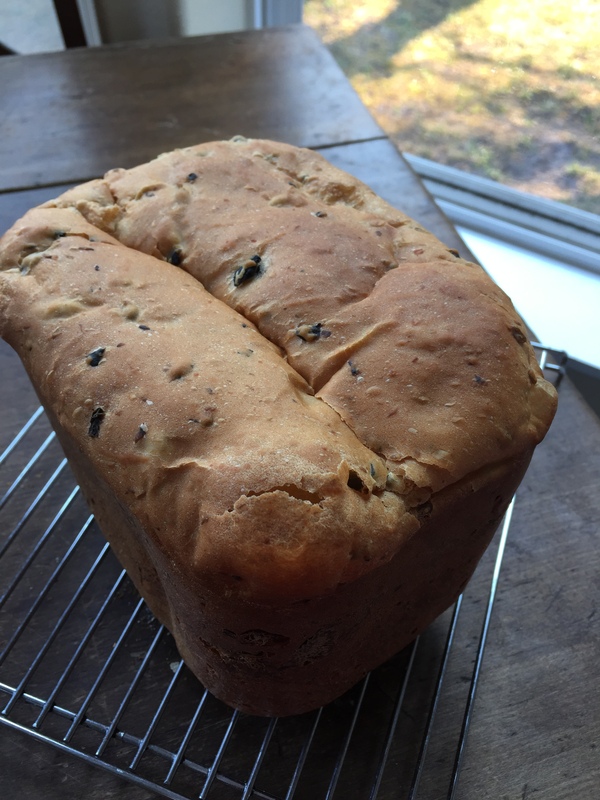 Ingredients were added to the bread machine as follows: 1 1/8 cups water, 1 tablespoon olive oil, 1 teaspoon salt, 2 3/4 cups bread flour, 1/4 cup yellow cornmeal, 1 tablespoon gluten, a pinch of sugar, and 2 1/2 teaspoons bread machine yeast. I used the French bread setting and the medium crust options. When the machine beeped between kneads 1 and 2, I added the pancetta along with 4 ounces of fresh, whole milk mozzarella, cut into small cubes. I believe I made a mistake choosing the French Bread setting for this loaf. The extra rise cause the loaf to touch the top of the bread machine, and then crater. It was a very tasty loaf, though. We sliced some and served with with fruit and cheese we had picked up at the farmer’s market in Olympia. Not the prettiest loaf I have made, but very tasty.